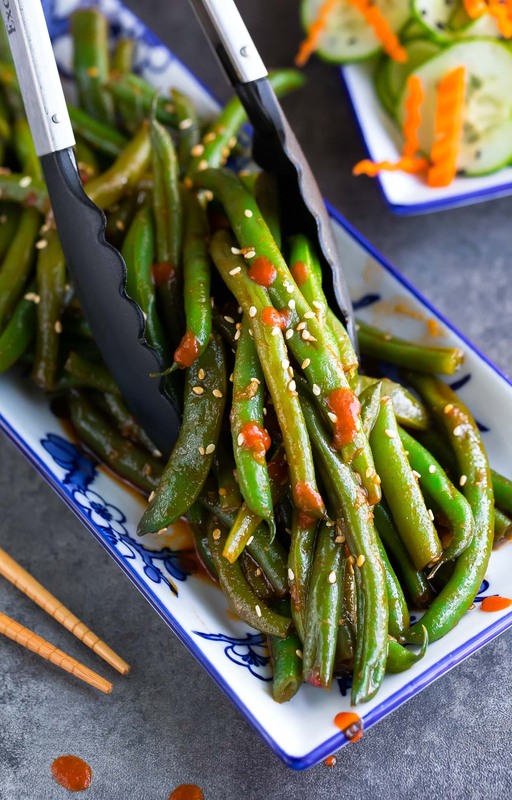 These Spicy Sriracha Green Beans are fast and flavorful! Grab some garlic and green beans and meet me in the kitchen for this fiery and delicious side dish! I’ve been craving the spicy green beans from PF Chang’s extra fiercely lately. Our nearest PFC, however, is over 90 minutes away and that drive totally not happening right now! Instead I took little fiery inspiration from my favorite restaurant side dish and put my own Sriracha-flecked spin on it. The result? GREEN BEAN HEAVEN! These sweet and spicy green beans crazy tasty and freakishly fast too. I’ve legit never inhaled green beans so fast in my life. Paul and I adore this recipe (they’re a bit too spicy for the kiddo) and cannot WAIT for y’all to try them! 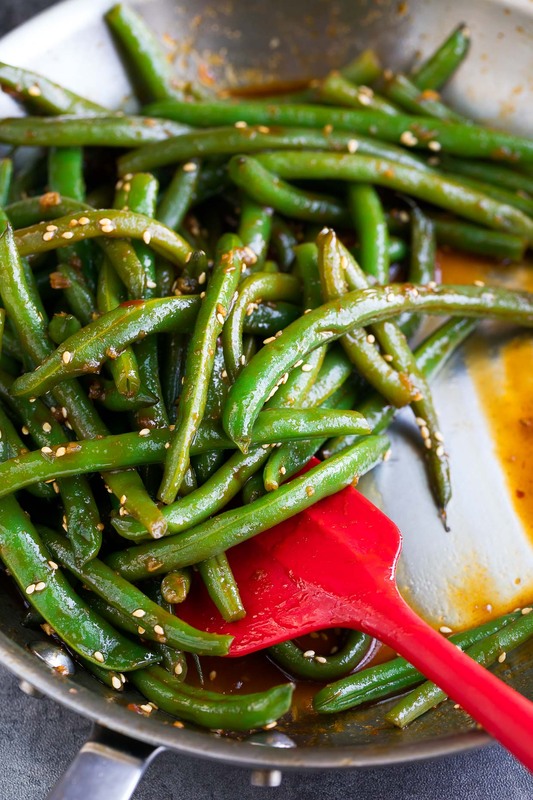 You’ll only need 6 ingredients to whip up these spicy green beans in your kitchen. 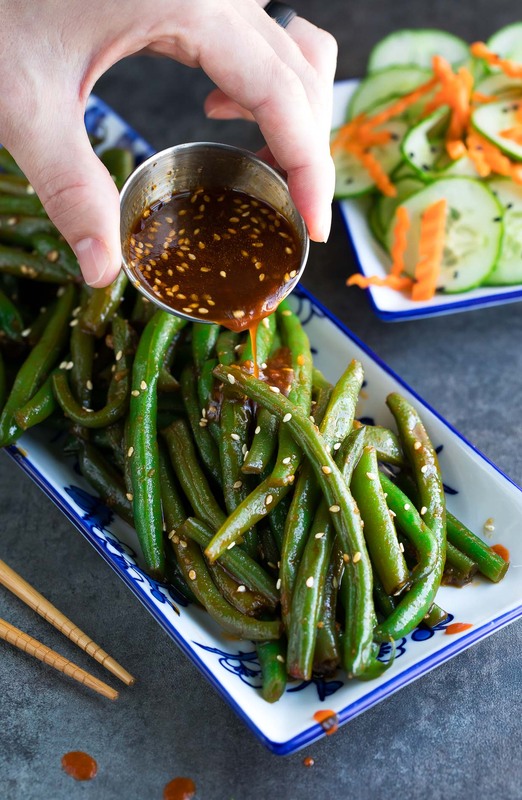 Green beans, garlic, sesame oil, Sriracha, sweet chili sauce, and soy sauce. You can also add toasted sesame seeds to the mix if you’re feeling a bit extra. I always have some on hand and like to toss them over all my Asian-inspired dishes like edible confetti. Other tasty extras include sliced green onion and/or crushed red pepper flakes, in case you need even more fire for your face. Craving extra garlicky green beans? Feel free to add extra if the craving strikes! 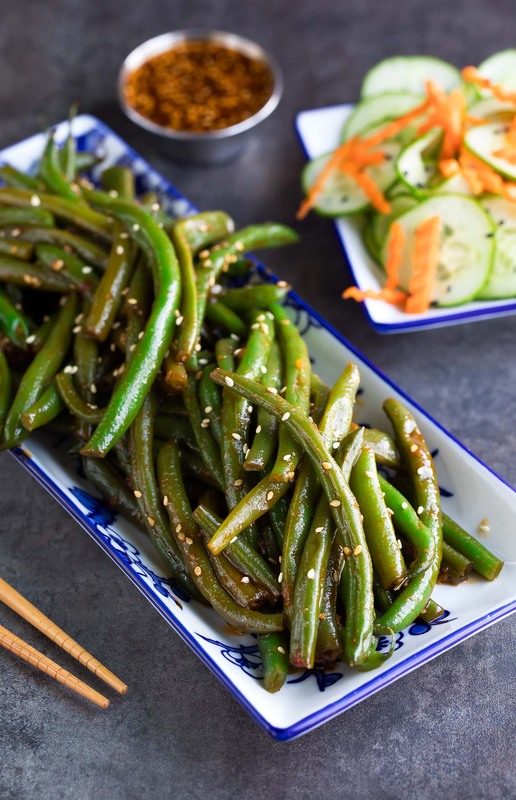 We love these spicy sriracha green beans served with fluffy long grain rice and a simple cucumber salad. You can even make extra sweet and spicy sriracha glaze to drizzle over your rice. Cue excessive fanning and swooning! It’s also fantastic with honey garlic shrimp, salmon, tofu, steak, or chicken and pretty darn delicious alongside my veggie-packed quinoa fried rice! The meal combinations are pretty much endless! Fill a large pan with 1 inch of water and bring to a boil. Add green beans and blanch for 3 minutes. While the green beans cook, fill a large bowl with ice water and set aside. Next whisk together your sauce by combining soy sauce, sweet chili sauce and Sriracha. I added an extra half TBSP of Sriracha to my sauce, making it about 1.5 total and found it perfectly spicy without going overboard. Feel free to add as much as you'd like to increase the heat, or adjust as desired based on your spice preference. Empty pan into a colander to drain and add beans to your ice water to halt the cooking process, then drain once cool. This takes about a minute. Reduce burner to medium heat and add your sesame oil to the pan. Sauté minced garlic for 30 seconds, or until fragrant and simmering, then return your green beans to the pan. and mix well to coat the green beans with the oil and garlic. Add your sauce and allow to simmer for a couple minutes, uncovered, to thicken the sauce. One desired tenderness is reached they're ready to eat! Stir so the Sriracha glaze coats the green beans and dive in! See post for tasty serving suggestions and meal pairings. I used Low Sodium Gluten-Free Tamari Soy Sauce for this recipe, but your favorite soy sauce will work great! I like to stick with low-sodium so the saltiness and flavor of the dish is just right! Feel free to use extra Sriracha to make this dish as spicy as you'd like! As written these garlic green beans are vegan, vegetarian, and gluten-free if you use compliant soy sauce. Woot! They can also be made in a single pan making this one-pan wonder a great weeknight option. 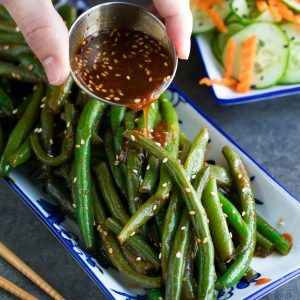 If you get a chance to try these spicy sriracha green beans, let me know! Leave some love in the comment form below or tag your photos with @peasandcrayons on Instagram so I can happy dance over your creation! We have a bunch of tasty green bean salad recipes here on the site from our crazy popular Greek Green Bean Salad to our Summery Farmer’s Market Chopped Salad with Creamy Avocado Dill Dressing. There’s also a Chickpea Chopped Salad featuring green beans that rocks our socks! Super easy and yummy! The sauce has the perfect amount of kick and is insanely flavorful. Couldn’t get enough — definitely going to be a crave-worthy go-to side in my house. I could seriously eat them every week! Thanks Karly! YES!!!! As soon as I saw these I knew I needed them in my life. 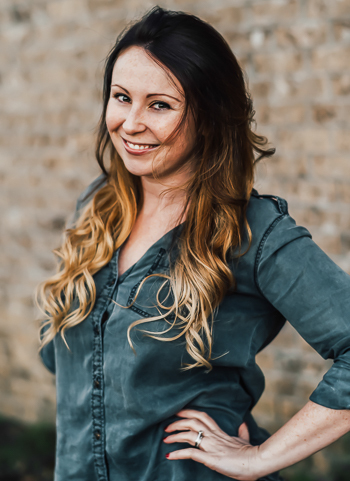 Thank you for a great recipe…LOVE IT!!! AND PINNING IT!!! I could make a meal out of these green beans alone! So good!